I: Vaughn 9-73; Hoppmann 20-71; Kimbrough 3-7; Clayberg 1-1; Limerick 1-0; Clay 1-minus-2; Switzer 3-minus-3. N: Ross 13-86; Claridge 16-58; Martin 4-28; Powers 7-28; Johnson 9-22; Thornton 4-17; Young 5-9; McCloughan 2-9; Bonistall 1-minus-10; Faiman 1-minus-13. I: Hoppmann 7-12-1 70; Switzer 0-2-1 0. N: Claridge 9-13-0 153; Faiman 0-2-0 0. I: Limerick 5-54; Monterey 1-11; Schreiber 1-5. N: Huge 4-83; Tomlinson 1-38; Powers 1-14; Johnson 1-9; Eger 1-7; Comstock 1-2. N: Theisen 1-12; Tomlinson 1-5. N: Toogood 1-3; Brown 1-0. Nebraska made it three in a row with a convincing 36-22 victory over Iowa State in the first Big Eight test of the season. With Dennis Claridge scoring three TDs and passing for another, Nebraska had a 28-0 lead with only 7:49 gone in the second quarter. The Cyclones – sparked by All American Dave Hoppmann and a fine soph, Tom Vaughn – refused to holler “uncle” and battled for 22 points. But the early NU jump was too much. Nebraska’s first-quarter TDs came on drives of 70 and 80 yards. 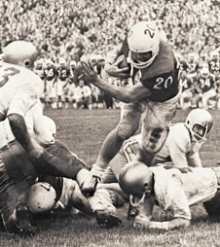 Fullback Bill “Thunder” Thornton left the game in the first quarter with a leg injury, and Dennis Stuewe remained sidelined from his injury at Michigan. … With the victory, NU moved up to 15th in the UPI poll, and the Orange Bowl was reported to be expressing interest in the Huskers.